When I was preaching in Baltimore in 1879, an infidel reporter, who believed I was a humbug, came to the meetings with the express purpose of catching me in my remarks. He believed that my stories and anecdotes were all made up, and he intended to expose me in his paper. One of the anecdotes I told was as follows: A gentleman was walking down the streets of a city some time before. It was near Christmas-time, and many of the shop windows were filled with Christmas presents and toys. As this gentleman passed along, he saw three little girls standing before a shop window. Two of them were trying to describe to the third the things that were in the window. It aroused his attention, and he wondered what it could mean. He went back, and found that the middle one was blind—she had never been able to see—and her two sisters were endeavouring to tell her how the things looked. The gentleman stood beside them for some time and listened; he said it was most interesting to hear them trying to describe the different articles to the blind child—they found it a difficult task. After the meeting this reporter came to me and asked where I got that story. I said I had read it in a Boston paper. He told me that it had happened right there in the streets of Baltimore, and that he was the gentleman referred to! It made such an impression on him that he accepted Christ and became one of the first converts in that city. Many and many a time I have found that when the sermon—and even the text—has been forgotten, some story has fastened itself in a hearer’s mind, and has borne fruit. Anecdotes are like windows to let light in upon a subject. They have a useful ministry. 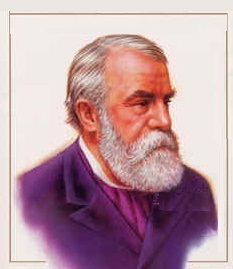 D. L. Moody — Dwight Lyman Moody (February 5, 1837 – December 22, 1899), also known as D.L. Moody, was an American evangelist and publisher connected with the Holiness Movement, who founded the Moody Church, Northfield School and Mount Hermon School in Massachusetts (now Northfield Mount Hermon School), the Moody Bible Institute, and Moody Publishers. "13 They brought him who formerly was blind to the Pharisees. 14 Now it was a Sabbath when Jesus made the clay and opened his eyes. 15 Then the Pharisees also asked him again how he had received his sight. He said to them, “He put clay on my eyes, and I washed, and I see.” 16 Therefore some of the Pharisees said, “This Man is not from God, because He does not keep the Sabbath.” Others said, “How can a man who is a sinner do such signs?” And there was a division among them....24 So they again called the man who was blind, and said to him, “Give God the glory! We know that this Man is a sinner.” 25 He answered and said, “Whether He is a sinner or not I do not know. One thing I know: that though I was blind, now I see.”" (John 9:13-16, 24-25).